Toward s the end of 2016, Twitter began testing the removal of @ replies from the character count. The tests must have been successful as they have just announced the new changes are about to roll out on mobile and the web. Twitter allows their users just 140 characters to get their messages across to their audiences. Users of Twitter generally love this form of microblogging, but there have always been a few niggles about the struggle of fitting everything in, especially when adding links, images and when replying to others. Last year, Twitter started making a few changes to help users make the most of their allowed characters. They began by no longer counting media attachments, a move that has generally received praise, even from a long time Twitter users who are passionate about the platform. 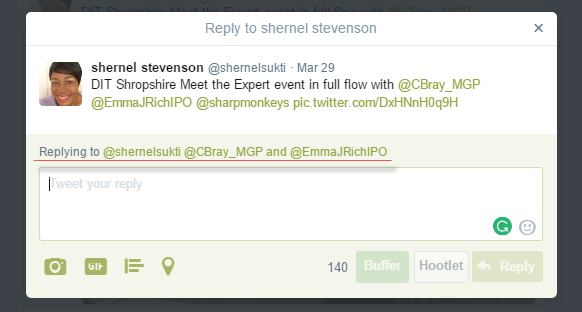 To make the most of this new feature you will need to click on ‘Replying to’ arrow beneath the Tweet. Once clicked a box is opened up and details of who you’re replying to are shown above the box where you enter your reply. Links still do count, unfortunately for us marketers, but the above changes have certainly made things a lot easier. It’s also great news for your customers who choose to contact you via the popular social network. By removing the @ replies, your customers will have more space to ask questions or seek help or simply just interact with you. It makes it easier to read long thread conversations too as you’re able to make sense of the conversation with ease. Next PostDo You Need to Upgrade to an Instagram Business Profile?